Common courtesy. What is it? Well, for one thing, it certainly isn’t as common as it used to be (I now realise that statement makes me sound about a hundred years old, and you may now be picturing me smoking a pipe, squinting into the middle distance and chuntering about ‘the good old days’). In reality, I’m a mere 36 but I don’t think that precludes me from bemoaning the moral decline of manners and decency towards others. I was brought up to be polite and show consideration to others – a fairly standard part of being a human being – or so I thought. I was obviously mistaken. 1) Smiling and saying hello to someone, only to be ignored, rebuffed with a sullen grunt or to receive a menacing stare. 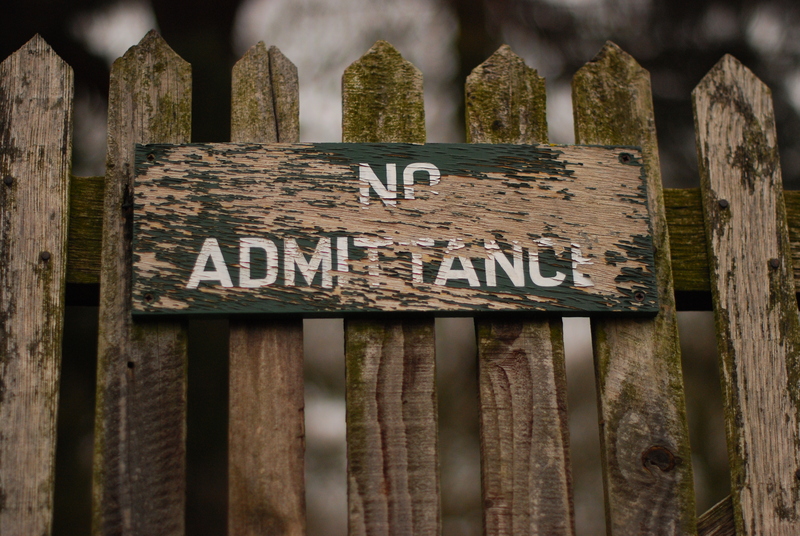 2) Holding a door open for the person behind you, for them to sail past without acknowledgement or gratitude. Oh, I’m sorry, I forgot I’m invisible. I must remember to wrap myself in bandages next time I want to be seen. 3) Following an individual in to a building only to have the door closed in your face. Remove your head from the dark place in which it currently resides and notice the similar-looking organisms that surround you – they’re called people, you self-absorbed imbecile. 4) Using your phone to listen to music in a public place – particularly on the bus – without the use of headphones. Firstly, the kind of person likely to do this usually has awful taste in music. Secondly, music played through a tiny phone speaker sounds terrible anyway. Thirdly, headphones were invented a LONG time ago. Use them, you inconsiderate troglodyte. And, at the risk of once more donning my ‘Old Man Withers’ pipe and slippers, it only seems to be getting worse. What next – someone using my shirt sleeve to wipe their nose? It’s coming . . . mark my words. What are your pet hates when it comes to lack of etiquette and civility? Or perhaps you regularly indulge in some of the behaviour I have outlined and think I’m being a little over-zealous? Let me know your thoughts below. I think we would all agree that the Internet has brought with it a plethora of benefits for both the consumer and the producer of products, music, books and art. As a musician, I can record a song in my garage and 5 minutes later I can have it online ready to be enjoyed by my masses of adoring fans (ahem. Well maybe just my mum and some weird bloke called Gideon, that refuses to leave me alone and says he knows where I live). The point is, there is potentially a massive audience that I can now sell or promote to directly. The same can be said of books – never has it been easier to self-publish your work and release it to the public, eager to consume your literary genius. However, we all know you can’t just throw it out there, willy-nilly. No. First it needs to be categorised, labelled and put in to one of the now countless genres and sub genres that have sprung up to worship the god of Marketing. 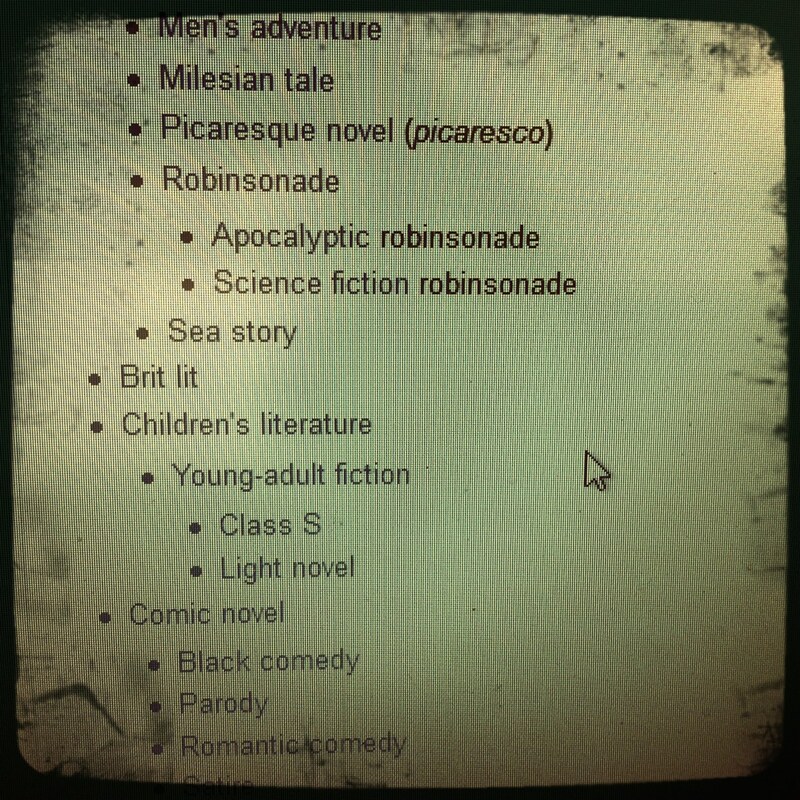 It used to be Romance, Adventure, Sci-Fi, Horror, Comedy, Crime and maybe Literary. Now, one look down the genre list of Amazon is enough to make you wince. And that’s before you get in to all of the cross-over and sub genres. Don’t even get me started on music! Being Typecast . . .
Don’t get me wrong – I love that there is such a diverse range of material to choose from – what I object to is having to get everything I produce to fit, very neatly, in to one of these little boxes. And once I shoehorn it in there . . . that’s it – I’m now typecast as the Horror Writer, the YA Author or the Indie Musician. I’ve had some personal experience of this with songs I have written . . . being criticised for being too eclectic! We wouldn’t know how to market that, mate, they say. Shouldn’t variety in our output be a good thing? This is why many popular artists and albums of recent times stick very rigidly to one genre, one style, one sound to ensure continued success. Apart from some notable exceptions (David Bowie, Stephen King et al), our mastery of Marketing has been to the detriment of making interesting art. Have a listen to Revolver by The Beatles, or take a look at the range of books by Roald Dahl – no two songs or novels are the same. They didn’t bother to hang around trying to categorise what they were doing – they just wanted to produce work that interested and inspired them and that’s why their music and stories still resonate today and will continue to do so for a very long time. I know using genres and labeling your work is a necessary evil and now impossible to avoid – but don’t let it dictate what you produce for the rest of your career. What are your thoughts on the rise of classification and the complexity of genre? Is it good for your audience and good for you? Am I whinging without good reason? I would love to hear your comments below. This was my 16th post for the A-Z Blog Challenge. Follow the blog during April for more writing tips, inspirational life posts, short fiction, film-inspired articles and more songs with audio recordings. Next post – Q – It’s always the Quiet Ones who are Writers. I really am a very sensible, mature individual. Honest. I have a problem. It has been with me for as long as I can remember and over the years it has been the cause of both embarrassment and harassment. Many people would (and have) argued that it only requires some self-control and discipline to prevent it occurring, but I genuinely do feel powerless to stop it from happening. The condition to which I refer is variously described as FAS (Foreign Accent Syndrome), Extreme Social Empathy or Childish Mockery. It’s usually the latter term that my friends and relatives like to use, but I can only assume that this is because they are insensitive bounders, ignorant to my plight. You see, to put it bluntly, when I find myself in the company of people with foreign or regional dialects for any amount of time, I feel compelled to mimic their accents and speech patterns. I have “why aye’d” to Geordies, “Have a nice day’d” Americans and even said “How-you-say” to an English-speaking Frenchman. This is usually met with bewilderment, derision, embarrassment and – on at least one occasion – aggression. Playing to stereotype, the threats of violence were the result of ordering “a wee bit of haggis” from a Scottish chip shop. However, now I have a powerful ally in my claim to innocence: Science. Several studies have now shown that it is simply human nature to adopt the accents, etiquette or dietary preferences (ok, I lied about the last one) of those around you. The theory is that as a social species, humans have developed the ability to empathise with different types of people, just as we adapt to different environments and surroundings. It’s really nothing more than an evolutionary survival instinct. So, in some ways, I’m actually a very highly developed example of the human race. Or just an immature man that likes to do silly voices. You decide. Am I alone in my affliction? What embarrassing social ineptitude are you guilty of? This was my 9th post for the A-Z Blog Challenge. Follow the blog during April for more writing tips, inspirational life posts, short fiction, film-inspired articles and even some songs with audio recordings. Next post – J is for Jokes. Being funny is no laughing matter. H is for History – Don’t forget the ‘STORY’ part! 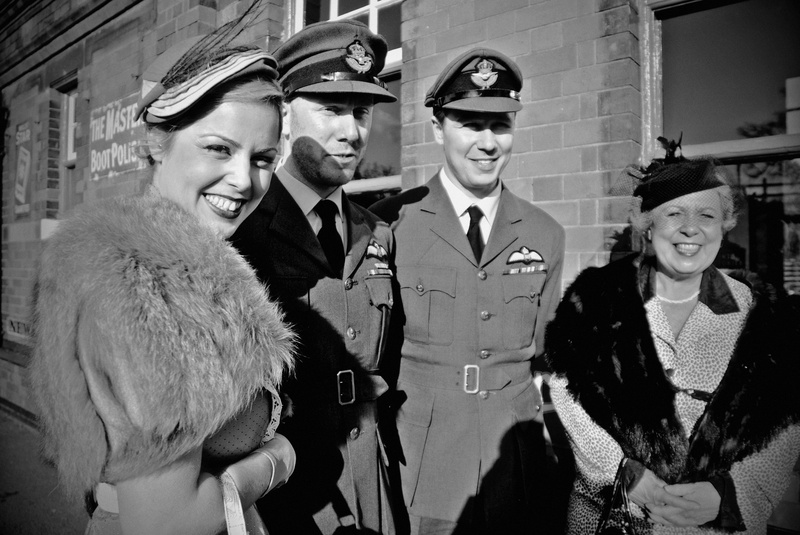 The Baldwin Family, 1940’s Theme Day at Great Central Railway, Leicestershire by Wayne Kelly. It’s people and their story that can bring History to life. TEACHER: How many wives did Henry VIII have? TEACHER: Who led the NAZI’s in World War II? PUPIL: Errr . . . were they the bad guys, sir? TEACHER: Come on, come on! Here’s a clue . . . he had a little moustache. PUPIL: Oh . . .Charlie Chaplin, sir? When I was a lad (he said, as if harkening back to some golden age – but was actually during the 80’s and 90’s) I enjoyed most of my time at school. Like everyone else, I had the subjects I was more drawn to (English and Design) and the others that I often felt were lurking there, directly after lunch, ready to sap the life out of me. One of the latter group was, unfortunately, anything to do with History. In fact, during my school days, there wasn’t even a subject devoted to History as it was covered by the bland management-speak title of Humanities. In practice Humanities covered Sociology, History and anything else that found itself orphaned by the fickle father known as The National Curriculum. As such it really wasn’t given any kind of focus, and when we did spend a few weeks learning about ‘The Tudors’ or ‘The Industrial Revolution’ it seemed to be taught with the sole purpose of embedding a handful of important names and dates in to our tiny developing minds – like teaching a chimp to play a tune on a piano in reward for a nice ripe banana. Or, in our case, a possible C grade in our GCSE exams. We were given facts and figures and taught to regurgitate them to pass a test. For me, the result of this was to turn me off to the fascinating and important events of the past. It was only as I got older and was introduced to History in different ways that I realised just how much stuff I had missed out on. Initially it was watching films like The Killing Fields and Schindler’s List, which made me want to actively search out more information from documentaries and books. More recently, my dad suggested I read Conn Iggulden’s series of novels based on the life of Genghis Khan. I have to admit, I wasn’t entirely convinced that I would even make it through the first chapter, as Historical fiction has never been appealing to me. To my astonishment and delight, I was hooked after the first paragraph and devoured the entire series in a matter of weeks. What did all of these examples have in common? They all centred around a great story and engaging characters. That those stories and characters were based on real events only served to give them more impact. Thankfully, in recent times, things have improved somewhat. The Horrible Histories series of books and television programme have managed to attract many more youngsters to a subject that children often thought to be dry and boring. Morpurgo’s brilliant ‘War Horse’ novel, and subsequent play and film, is another excellent example of what can be achieved by focusing on what really matters – telling the story. In the hands of a skilled story-teller – a film-maker, a novelist, a teacher – History can and should be compulsive, addictive and able to engage even the most hardened cynic. If I can learn to love History – anyone can. What are your experiences of being taught History? What engages you? This was my 8th post for the A-Z Blog Challenge. Follow the blog during April for more writing tips, inspirational life posts, short fiction, film-inspired articles and even some songs with audio recordings. 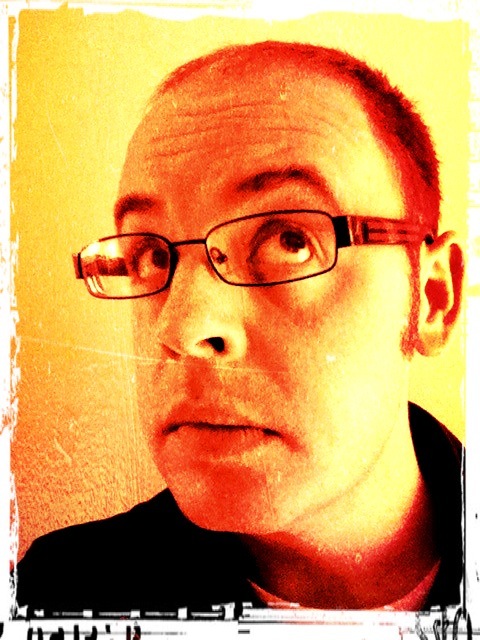 Next post – I is for Imitation, the sincerest form of flattery – honest! Fellow Geeks Unite! Are We Not Men? Most of the time I feel like a fairly capable, intelligent person. And whilst I have all of the athletic prowess of a common garden snail and the physique of Benny Hill, for the most part I am assured of my masculinity and social standing. Fair enough, I wasn’t educated at Oxford or Cambridge nor was I prop forward (don’t even know if that’s an actual Rugby position) for my school team but I did play a bit of footy and didn’t shy away from the odd rough tackle (no, that isn’t a euphemism). So why is it that now, in my early 30’s, there are still 2 topics that make me feel like I do in that recurring dream that everyone has where you find yourself standing in your PE class wearing a girl’s gym slip? (What do you mean, you’ve never had that dream before?) And the dual causes for this sudden reduction in my masculinity and self belief? DIY and Football talk. Just because I don’t follow a particular football club or have no interest in how to put up a set of shelves using self refracting monkey bolts, I immediately become a social pariah. I once had a 15 minute conversation with a taxi driver about how badly the ‘Blues’ were playing that season. I managed to blag my way through a quarter of an hour by nodding my head sagely and saying “exactly,” and “yeah, good point,” etc, until eventually he asked me who my favourite ‘Blues’ player was (no, I didn’t say Muddy Waters or Howlin’ Wolf – he was reffering to a football team). I scrambled for a few seconds and then, with great relief, I managed to recall the one ‘Blues’ player that I knew at that time. There was a momentary pause as the driver processed this information. “But he plays for Leicester City . . .” he said. “Yes, I know” I confidently retorted. That was pretty much the end of the conversation and the final ten minutes of the journey were painfully silent, save for the gentle jingling of the driver’s Birmingham City mascot hanging from the rear view mirror. As mentioned earlier, my other weakness comes in the form of DIY or anything that requires what ‘manual types’ refer to as ‘common sense’ or ‘being good with your hands’ – mind you, the latter was said about Bill Clinton and look how that ended. Because of my general lack of interest in this area and, it has to be said, my past ineptitude, I tend to avoid doing any home improvement activity that involves anything more complicated than changing a fuse or ‘turning it on and off again’. However, it was a recent conversation I had with one of those very ‘manual types’ whilst waiting around at my daughter’s parents evening a couple of weeks ago that spurred me in to action. Once again my stupid bloody machismo has lead me in to a trap. He was a nice guy, and we got on to the subject of houses etc. He was explaining all of the jobs he still has yet to complete in his home. My fiancee cackled like The Wicked Witch of The West and then very kindly brought it to the guy’s attention that I was completely useless at DIY and that we always paid someone else to do stuff like that. Within those few seconds after the proclaimation of my fecklessness, all of his warmth and laughter died . His smile became a frown and he repeated the words as if searching for some hidden meaning. In that moment of embarrassment and shame I became resolute: I CAN DO DIY. I WILL DO DIY. Goddammit! Am I Not A Man?! Half an hour later the tube of sealant lay in the bin and the remnants of my tool kit was up for auction on Ebay. It’s time to accept what I am. I may not be a walking Football encyclopaedia or have a working knowledge of how to use the detachable Sparrowflange, but I’m still a man. I’d like to see how one of those ‘manual types’ would cope if I asked them to edit a 2 minute interview from 2 hours worth of footage and then encode me a 2-pass MPEG2 file with a maximim bitrate of 7.2. Let me know if you’ve had any similar ‘feeling like a geek/nerd/loser’ experiences. Fellow geeks unite! After all, are we not men too?